A straight line may be defined by two endpoints & an equation. In fig the two endpoints are described by (x1,y1) and (x2,y2). The equation of the line is used to determine the x, y coordinates of all the points that lie between these two endpoints. Using the equation of a straight line, y = mx + b where m = & b = the y interrupt, we can find values of y by incrementing x from x =x1, to x = x2. By scan-converting these calculated x, y values, we represent the line as a sequence of pixels. 1. Line should appear Straight: We must appropriate the line by choosing addressable points close to it. If we choose well, the line will appear straight, if not, we shall produce crossed lines. 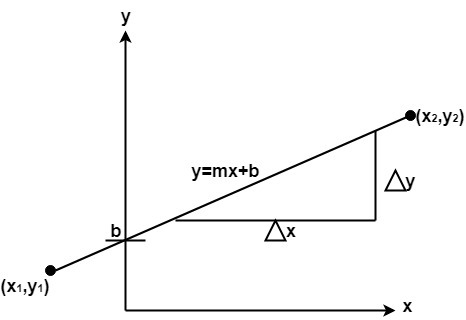 The lines must be generated parallel or at 45° to the x and y-axes. Other lines cause a problem: a line segment through it starts and finishes at addressable points, may happen to pass through no another addressable points in between. 2. 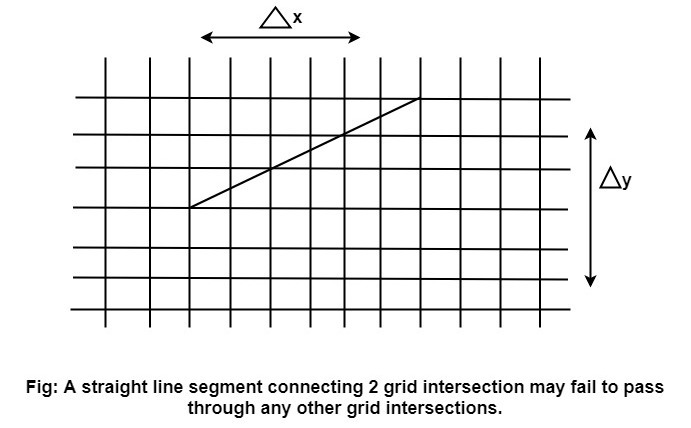 Lines should terminate accurately: Unless lines are plotted accurately, they may terminate at the wrong place. 3. Lines should have constant density: Line density is proportional to the no. 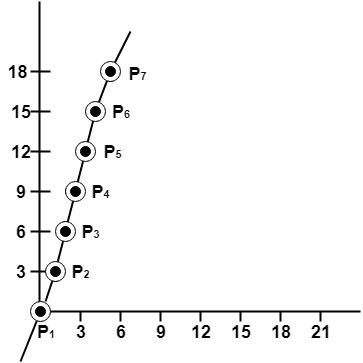 of dots displayed divided by the length of the line. To maintain constant density, dots should be equally spaced. 4. Line density should be independent of line length and angle: This can be done by computing an approximating line-length estimate and to use a line-generation algorithm that keeps line density constant to within the accuracy of this estimate. 5. Line should be drawn rapidly: This computation should be performed by special-purpose hardware. It is the simplest form of conversion. First of all scan P1 and P2 points. P1 has co-ordinates (x1',y1') and (x2' y2' ). Example: A line with starting point as (0, 0) and ending point (6, 18) is given. Calculate value of intermediate points and slope of line. Step3: Enter values of x1,x2,y1,y2. 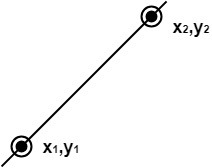 The (x1,y1) are co-ordinates of a starting point of the line. The (x2,y2) are co-ordinates of a ending point of the line. Step8: Set (x, y) equal to starting point, i.e., lowest point and xendequal to largest value of x.